You can transfer Talk calls to a group, another agent, or an external number. When you transfer a call to a group, the call is added to the queue for that group until an agent from the group answers it. When you transfer a call directly to an agent, you can consult with the other agent before handing off the call. Note: You cannot transfer calls with Zendesk Talk (Legacy) plans. To transfer calls, upgrade to a Team plan or higher. 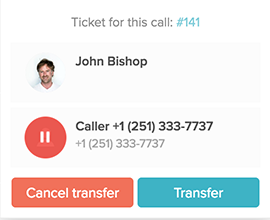 With all types of transfers, the call's existing ticket opens automatically when the next agent takes the call. Note: To transfer calls, at least one phone number must have outbound calling enabled. This setting is enabled by default. 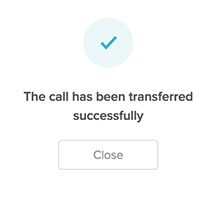 After you answer a call or make an outbound call, the associated ticket automatically opens. Click the transfer button from the ticket or the call console. The customer is placed on hold and hears the hold greeting. 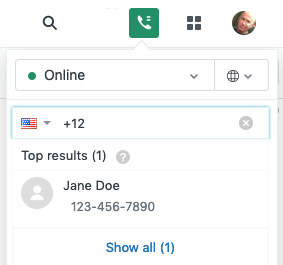 Start typing the agent, group, or end-user's name or phone number. Click on the agent or group's name to transfer a call. If transferring to another agent: You'll first be connected to the agent while the caller remains on hold. When you've finished consulting with the agent, click Transfer. If transferring to an external number: You'll need to dial the number, including the country code. When the receiver is picking up, the Transfer option appears. You can then introduce your caller to the receiver, and click Transfer. The message The call has been transferred successfully appears in the window. At this point, the related ticket is also assigned to the other agent. Click Close. This transferring call feature is useful, however is there a way to configure warm transfers? By warm transfer, I mean having the capability of having all three parties on the line before fully transferring the original caller to the third party. Can you clarify what you mean by "configuring" warm transfers? When transferring to an agent or external number, you simply stay on the line to consult with them before completing the transfer. What are you looking to configure? How do you keep the agent receiving the transferred call to NOT get the next call in queue? If there are calls in queue, the next available holding call will ring before the transferred call. My apologies for the limitation here. How can we call another skill group without having to automatically cold transfer? Can you clarify what you're trying to set up on your end in regards to transferring calls? Are you attempting to send the call to a specific group if an agent picks up? Any additional information you can provide is greatly appreciated! Is there a way to do a warm transfer if the call was forwarded to one of our mobile phones? +1 Rachel Seeman's question: Can two agents be speaking with the customer at the same time? What you're looking for is our Zendesk Talk Conference Calls beta. To sign up for the beta you can click here. How can I transfer a call to an external number with an extension?